Le Marché St. George would like to introduce you to the aesthetically striking and delicious fresh produce, jams and preserves of Parsons Farm Market. 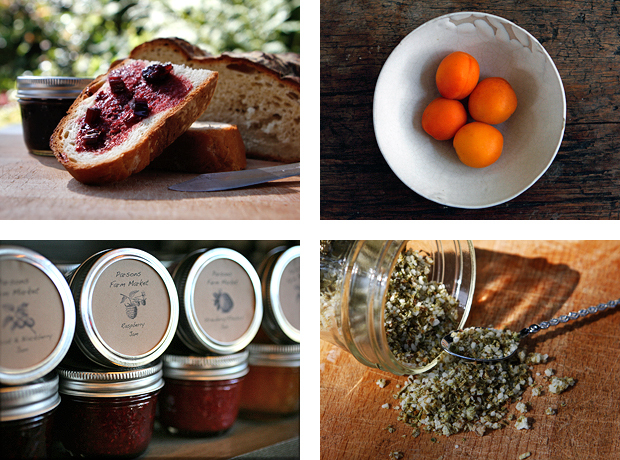 Currently, we are stocking fresh Apricots (top-right), Apricot & Blackberry Jam, Raspberry Jam, Strawberry / Rhubarb Caramelized Onion (top-left), Blackberry & Mulberry Jam, Apricot Jam, Garlic Scape Pickle and Garlic Scape Salt (bottom-right). Parsons Farm Market is a wonderful company; they also contribute their products to VanValley Food Connection, which we posted about here.